In a world that labels moms in categories including “crunchy” and “helicopter”, I consider myself an in-between mom. I am just not one way enough about anything to fit completely into any category. 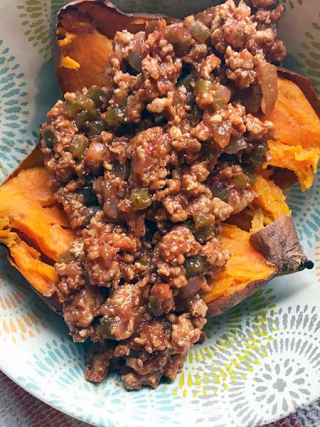 I am all about clean eating, giving my kids all the veggies, heck they think juice is a treat ranked high up there with birthday cake, because they only get it at parties where other people serve it up. However, just like with everything else, I am still in-between. 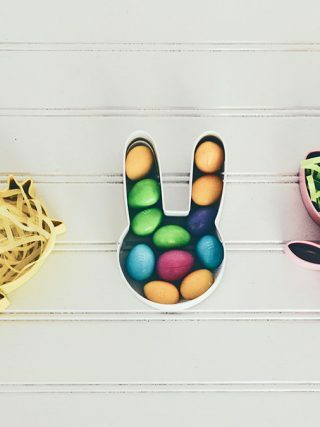 We’ve got to live a little, enjoy in moderation, and sprinkle some chocolate chips on life, right? 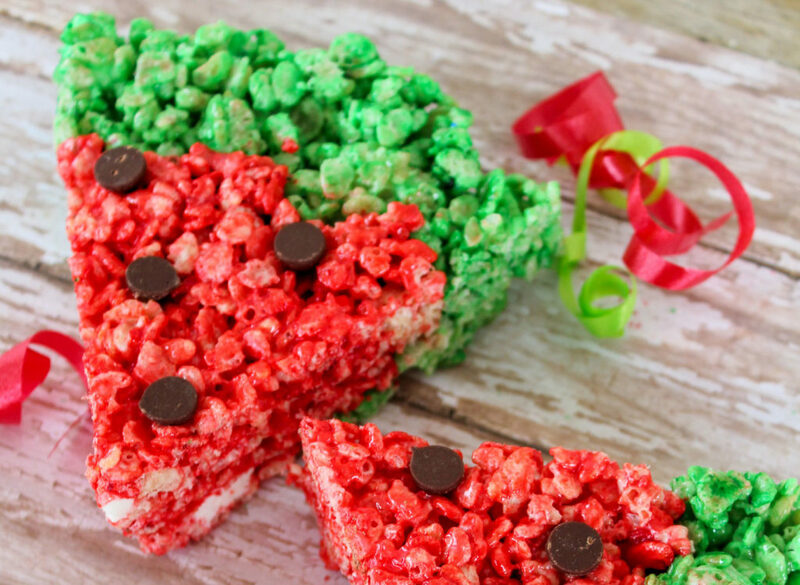 Enter watermelon rice krispie treats. 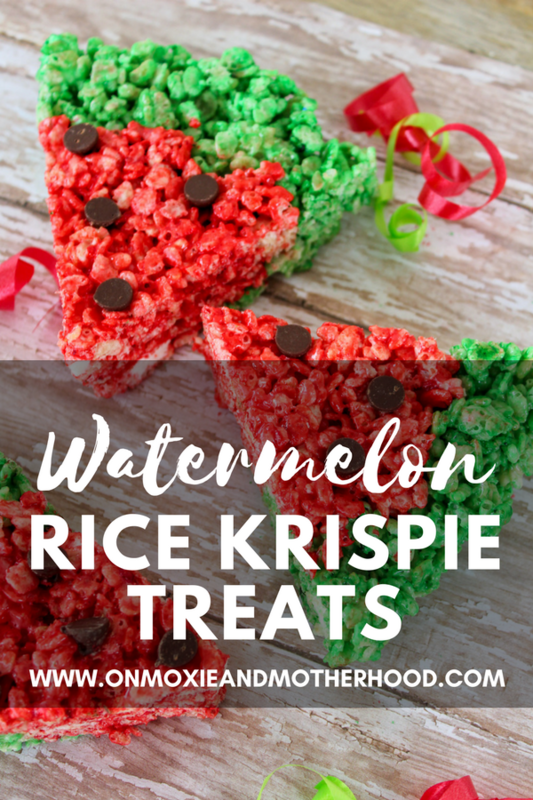 This treat ties together two of my favorite treats from childhood: watermelon and rice krispie treats. 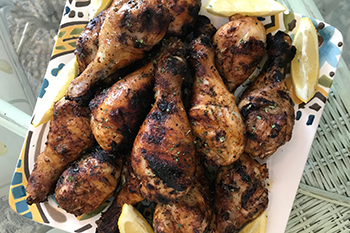 Go ahead and add these to your list of summer activities to do with the kids, they’ll love it! To make this magic happen, first you’ll need to line 2 cake pans with parchment paper. Then, melt the butter in a saucepan. Once melted, add the miniature marshmallows, reserving 1 cup. Stir until the marshmallows are melted. Next, add 1 tsp vanilla and mix. 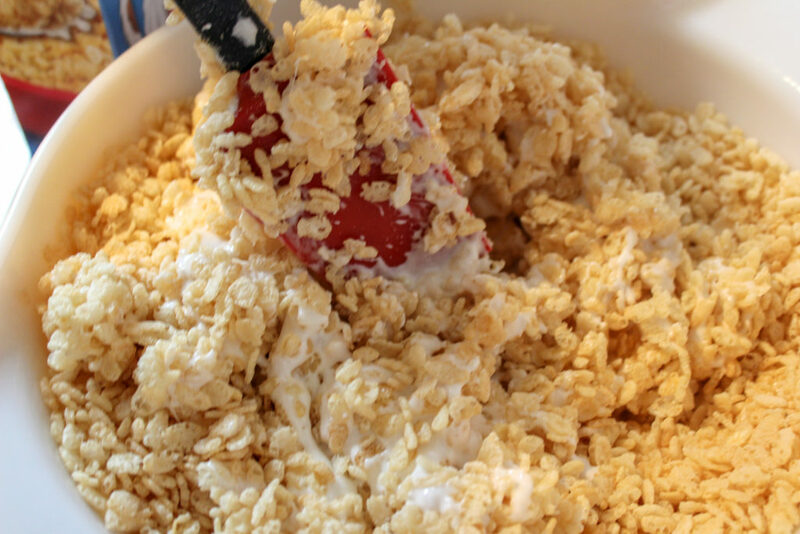 In a large bowl, pour the melted marshmallows over 6 cups of Rice Krispies and mix together. Stir in the last cup of marshmallows and mix together. Next, divide the Krispies into 2 different bowls. (Put just a little bit more into one than the other.) Tint one bowl green and the other red. I like to use the gel food coloring. The red comes out perfect without having to add a huge amount of coloring. 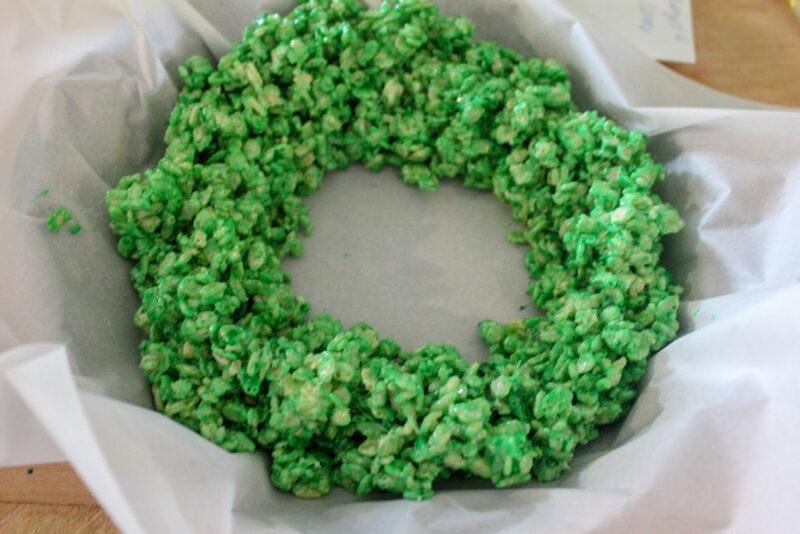 Start with your green krispies. This will be your watermelon rind. 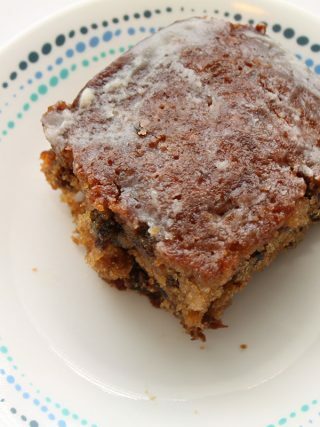 Layer it around the outside edge of your cake pan. 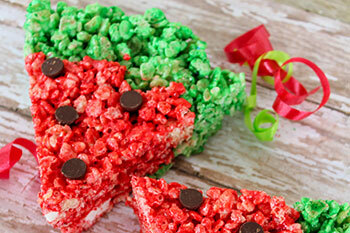 Once you have the outer green done, fill in the center with the red krispie mix. Press lightly into the pan and together to make sure the red and green will form together. Using chocolate chips, press gently into the red. These are your watermelon seeds, of course. Let sit for about an hour to fully set. This will make 2 pans of watermelon rice krispie treats, and if you’re like me, two very happy children! 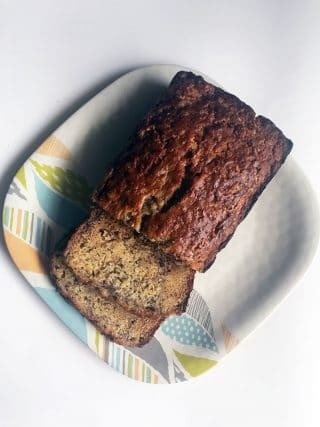 Line 2 cake pans (get them here) with parchment paper. Add the miniature marshmallows, all except 1 cup. Stir until the marshmallows are melted. Add 1 tsp vanilla and mix. 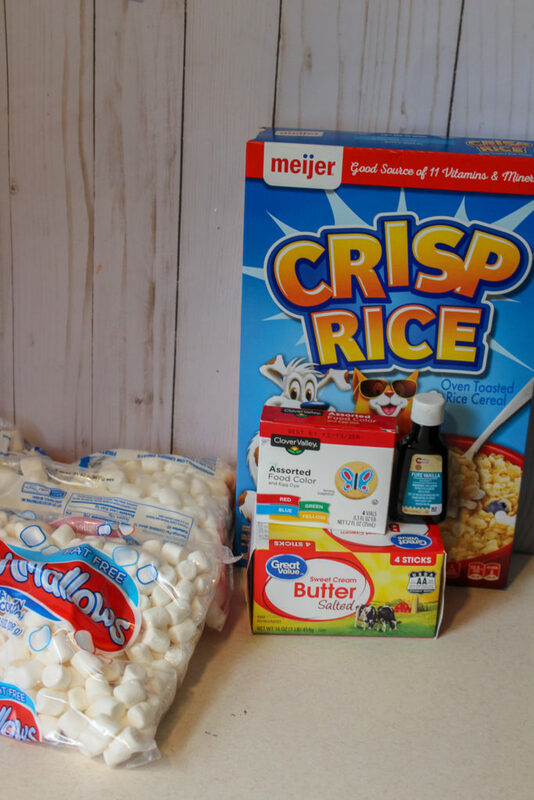 In a large bowl, pour the melted marshmallows over 6 cups of Rice Krispies. Stir in the last cup of marshmallows and mix together. 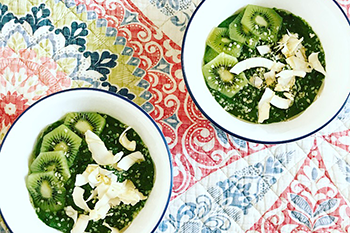 Tint one bowl green and the other red. I like to use the gel food coloring. The red comes out perfect without having to add a huge amount of coloring. 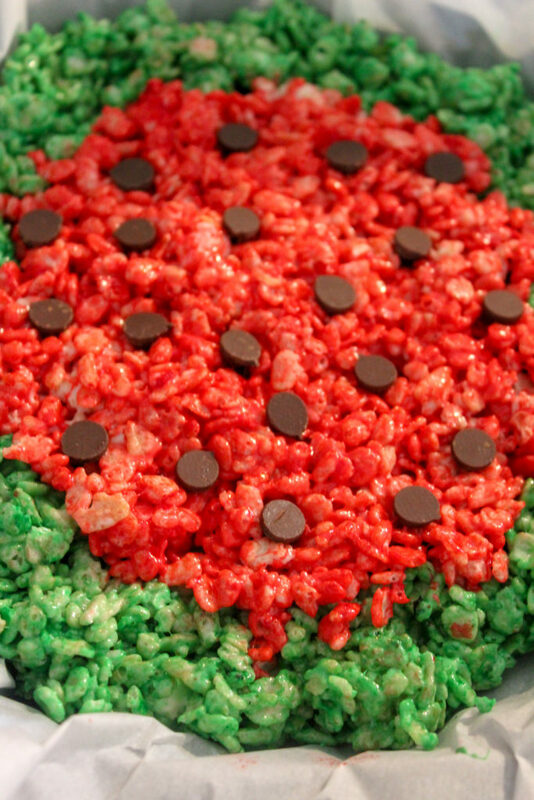 Once you have the outer green done, fill in the center with the red krispie mix. Press lightly into the pan and together to make sure the red and green will form together. Using chocolate chips, press gently into the red. These are your watermelon seeds. Let sit for about an hour to fully set. This will make 2 pans of watermelon rice krispie treats.